And these batteries are easy to size! For example, if 1500 Wh of energy is required daily for 3 days without sunshine (days of autonomy), and you have an inverter with 93% efficiency, you calculate 1500 Wh X 3 days/.93/.80 DoD = 6048 Wh battery bank. 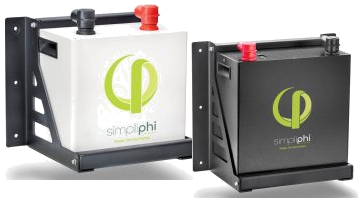 If you have a 24V system, you could use two (2) of the 3440 Wh 24V SimpliPhi Smart-Tech batteries in parallel for 6880 Wh capacity. Additional batteries can be added in parallel as your power needs increase.